I never knew my maternal grandfather William (Will) Liming Redles. He died when my mother was six years old and my Aunt Catherine was just over a year old. He was a career marine and was a lieutenant colonel when he retired. I've always been fascinated by him. Maybe it's because I know so little about his life before he married my grandmother, who was more than 20 years his junior, but the papers he left behind offer some very interesting clues. Lucky for us, he kept a lot of his correspondence, not only letters he received but copies of letters that he wrote. My father was writing a novel based on my grandfather Will titled, Death of a Colonel (n.d.). I don't know if he was finished with it. It's supposed to be fiction, and some of it is, but there's a lot of truth in it that my father got from Will's papers. My grandfather was born on November 1, 1873. His parents were George Albert and Isabella Liming Redles. He had two younger sisters, Helen and Isabella. He was born either in Philadelphia, Pennsylvania, or Mount Holly, New Jersey. I don't know which. The 1880 U. S. census says he was born in Pennsylvania, but as those of us who do family research know, the census isn't always accurate. His passport application says Philadelphia. Surely he's the one who filled it out and would know where he was born, or maybe he assumed if that's where he grew up. My mother has two newspaper clippings about his death and a copy of his death certificate that all say he was born in Mount Holly, New Jersey. Could the person that supplied that information have been mistaken? I don't have any information about my grandfather's early years. In Death of a Colonel (n.d.), my father writes that the main character Davenport (based on my grandfather) signed over the rights to a child in 1897 and paid $300 to the brother and father of the young lady. I asked my mother about this. She said she had seen the paper that her father had signed attesting to this. I looked for this document in the trunk where my mother keeps his papers the last time I was visiting her, but I couldn't find it. (Goodness, if it's true, I may have some more relatives out there somewhere.) Maybe it's in my father's papers somewhere. Not long after this, my grandfather had joined the Marines. 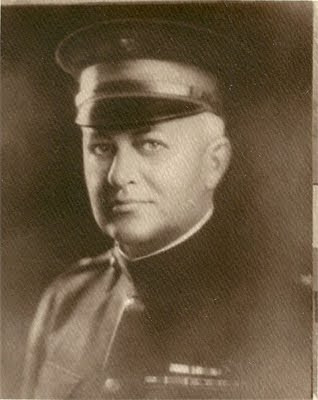 Appointed a second lieutenant on September 11, 1900, Col. Redles served on the marine guard of the Asiatic Fleet from 1902 to 1906 and was stationed in Cuba during 1907. In 1914 he was on temporary expeditionary duty with the Fifth Regiment in Cuba and San Domingo. He was appointed assistant attaché at the American Embassy at Tokyo, Japan, in 1915, and continued in that capacity until 1919. 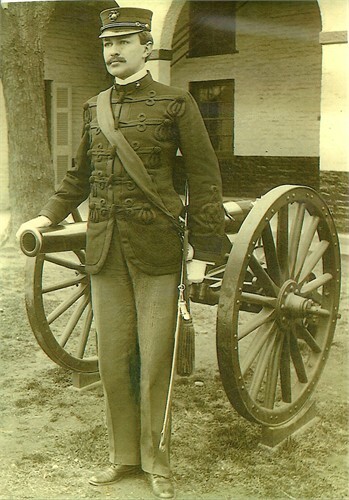 Col. Redles held an excellent record of service and had the distinction of being the only marine officer to have the Fourth Order of the Rising Sun and decoration of Daijiten awarded him by the Emperor of Japan for invaluable services to that country during the World War [World War I]. He also held the Cuban and Haitian Campaign Badges and the Expeditionary Ribbon for Panama. He was a brilliant linguist, having mastered six languages, and this combined with his rare gifts as a diplomat, made him of great value in foreign details where scholarship and diplomacy were required. Colonel Redles was a 32d Degree Mason, a member of the Scottish Rites and the Sojourner’s, and the Army and Navy Club. The Army and Navy Register adds that he served in naval intelligence from 1919 to 1923, then "he was ordered to Haiti and attached to the 1st brigade marines and served as brigade law and intelligence officer". My grandfather was introduced to my grandmother, Martha Leona Roberts, by his friend Warren Graham who was dating (and later married) my grandmother's sister Margaret. 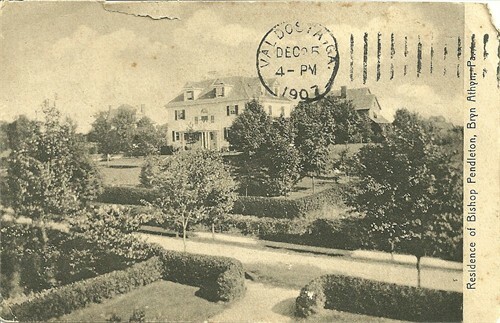 My grandparents were married on May 8, 1923, at Pendle House in Bryn Athyn, Pennsylvania. My paternal second great uncle William Frederick Pendleton, Bishop of the Swedenborgian Church, officiated. My grandparents lived in Haiti after they were married. When my grandmother was expecting their first child, she returned to Valdosta. My mother, their first child Leona Roberts Redles, was born November 18, 1925. Another daughter, Catherine Liming Redles, was born on February 9, 1931. My grandfather retired from the military in 1926. From his letters, it sounds like the military was forcing him to retire because of ill health, and he was not pleased. He died on August 29, 1932, at the naval hospital in Washington, D. C. His death certificate says the cause of death was arteriosclerosis from which he had suffered for eight years, but my grandmother told my mother that he believed he had been poisoned by the Haitians. I don't think I've ever heard why he believed this. He was buried in Arlington National Cemetery with full military honors. As my Aunt Catherine has said (or maybe it someone else), my grandfather had already lived one lifetime by the time he married my grandmother, so he was bound to have a history. When they married, he was nearly 50 years old, and she was 26. After my grandmother died in 1955, my mother and my Aunt Catherine were cleaning out her storage and found their father's papers and letters. There were all sorts of personal papers including letters to and from the military, my grandmother, his sisters, and his friends. There were also letters from some women with whom he'd apparently had some sort of relationship (if you get my drift) before he married my grandmother. However, the greatest surprise (besides the child mentioned above, if true) are the letters from a young Japanese woman written to him with the greeting "Dear Father," "Dearest Father"! !----but this will have to wait for another Pendleton Genealogy Post. About a year ago, I sent in a request to the National Personnel Records Center for copies of my grandfather's military records. I received a letter a few months later in reply stating that they could find no record of him and neither could the FBI! I called my mother and we had a good laugh over this and made all sorts of speculations (like, he was a spy!). The letter did say that if I had any information that might help locate his service records, to please send it in. I finally got around to it a month or so ago and did just that. I'm still waiting to hear from them. The wheels of bureaucracy turn slowly. Ancestry.com. Year : 1880; Census Place: Philadelphia, Philadelphia, Pennsylvania; Roll: 1181; Family History Film: 1255181; Page: 380D; Enumeration District: 447; Image: 0395. "Retired Army Officer, Native of Mount Holly, Dies in Washington." Mount Holly Herald, date unknown. Army and Navy Register. Obituary of William Liming Redles. Date unknown. Certificate of Death for William Liming Redles, District of Columbia, Record No. 345615, August 31, 1932. Colonel Redles Accorded Full Military Honors," Valdosta Daily Times, August 30, 1932.